Understanding the buyer is the base ingredient for a successful marketingstrategy. Marketers in the Netherlands lacked scientific insights in the business buyer. That’s a pity, since a successful B2B-strategy really depends on the high quality insights marketers should have when it comes to business buyers. To grant more insights, TNS NIPO developed the Business Buyer Insights, together with spotONvision. How business buyers investigate solutions? Which sources are more valuable than others? Which parties are considered, and what are the conversion rates? Business Buyer Insights maps all of this for 18 different category products and services. This ranges from office equipment, accountancy and security services. Do you want to be more successful in marketing and sales? 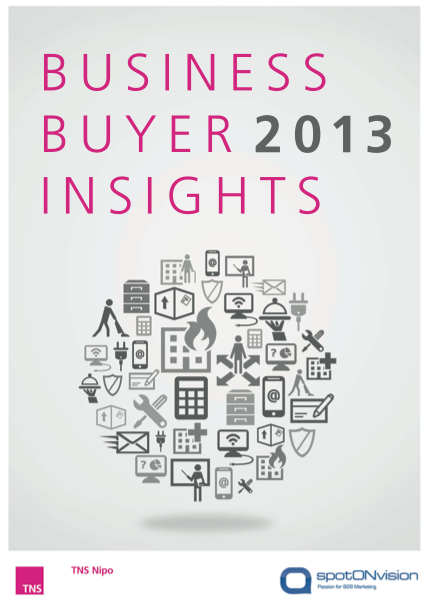 Download the Business Buyers Insights 2013 from TNS NIPO and spotONvision now.